Start with railings first. Apply one coat of stain to all railings. Take care to protect the floor from any drips. After the first coat is applied, apply a light second coat to the top of the railings only. This should be done 20-120 minutes after the first coat is applied. Repeat Step 2 for any wood benches or other vertical structures. Once done with the verticals, apply one coat of the Defy Stain to the flooring and walking surfaces. Make sure to do the entire floor. Reapply a second light coat to the floor within 20-60 minutes of the first coat. it is okay to walk on your first coat of stain even though it has not dried completely. Take care to no step in your second coat of stain. Do not apply 2 coats to brand new wood. Wear shoes that you do not care about getting stain on. Apply quickly to avoid overlaps. Do not over apply. Two light coats are best. Defy is a penetrating wood stain that works best by diving deep into the wood grain. Make sure to avoid “filming” of the stain on the surface from excessive application. Defy Stains are best applied with a stain pad applicator, brush, or sprayer. If You Need any Help, Please Ask Below! Hi..just had a firewood shed built with pressure treated wood and I’m letting the wood dry a bit before staining…is that a good idea? Also, this new wood should not get a second coat? What is the lowest outdoor temperature the stain can be applied? How long should I wait between the Brightener and applying the two coats of stain, i.e., can I apply the Brightener Friday afternoon and stain on Saturday morning if it is still damp? The deck has already been stripped. Thanks for your help. No. Has to dry 48 hours after final prep. I used linseed oil 2 years ago on a new wood doug fir porch. I have cleaned and brightened with defy just this past weekend. Given what was applied previously, should I anticipate any problems with staining? Should I do one or two coats? How can I check to see if the wood is ready for the product? Thanks. If water immediately soaks in then it okay to stain. If not, you will have to strip and brighten for the prep. Just the one coat will be good if Fall. Two light coats if you wait until Spring. Stain pads work just as well or better. Thank you for your quick reply. One more question. I am considering the clear stain but the color help page says it “offers limited UV resistance as exposed wood will need to be coated annually if you want to prevent graying”. I don’t mind the graying, but, are there other considerations for not staining annually? I think you do recommend staining every 2 years anyway, but please advise if that is not necessary. The Clear protects the wood from other elements but it will require annual prep and reapplication to keep the graying away. The tinted colors will last 2-3 times longer than the clear when it comes to UV graying. Otherwise, they are the same. Also, do you recommend sanding the wood during the preparation period prior to staining? Clean and brighten is the way to prep. No sanding. I built a new deck and have allowed it to weather over the past year. Do I need to apply two coats (wet on wet) or do I just apply one coat? I noticed your site said do not apply two coats to new wood. Two coats wet on wet is best since the wood as a year old. What if I can’t apply second coat within the time frame indicated for wet on wet application? Do I need a sealer after the second coat? Thanks. You have to apply it wet on wet if doing two coats. You cannot and do not need to apply a sealer on top of the Defy Stains. Had to quickly apply 2 coats of stain to last 2 boards of deck in order to meet 12 hour dry time before rain. Looked at the deck this morning after rain. All boards effectively beading up fallen rain except the last 2 boards stained. Is there any way to put one more coat of stain on those 2 boards? Not at this point as it will not soak in. Touch up those two boards in 4-6 months. I’m ordering everything, 5 gal stain, brighter, cleaner, & sprayer. Am I paying $36 shipping for the cleaner, etc? Because shipping on the 5 gallons are free, right? And, how do you ship? FedEx, UPS? Truck? Because UPS won’t deliver to the house, they deliver to the Post Office. Will it all come in one shipment? Shipping on 5 gallons is free. Other items do not ship free and that is why you have a shipping charge. We ship FedEx. Comes in multiples packages but most likely at the same time. We currently do not have any promo codes available. I have a new deck (6 months old, pressure treated pine) do I need 2 coats or one? Did all the prep on a new redwood deck, hired out to have extreme stain applied. Areas were only one coat was applied, etc. All in all just a very poor job. I want to redo it. Do I strip the previous stain off completely? Can I leave the verticals and railing only, they seem to be ok. How long should I wait to do it? Wait until Spring and strip and brighten the wood for the prep. Best to do all so it matches. I am staining a pressure treated deck that has “dried” for six months, should I only apply one coat on horizontal boards? I am laying 5/4 redwood cedar on my covered porch floor. New wood! Do I apply one or two coats of Defy Extreme Clear sealer? I have 130 feet of 10 foot deep porch that wraps around my house. I plan to put dividers in the cedar floor for a clean division, so I can build in sections and seal immediately. It has a lot to do with temps. 15-30 minutes is normal. “Do not apply 2 coats to brand new wood.” what about old boards that were sanded down to new wood? Can Defy Extreme Deck Stain be sold or shipped to Massachusetts? I used the defy cleaner and brightner on the cedar wood on my house. Looks great! Now I need to use the Defy water repellent wood stain. I am having hard time finding it in the cedar stain. I only see walnut or pine. Can I order it through your website and how much is it. I have an old redwood deck that I power washed two years ago. There is no stain on it. 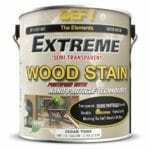 I plan to prep and stain with Defy Extreme. For prep, should I use Defy Cleaner and then power wash or power wash and then use Defy brightener. I’m in SoCal. You use both the Defy Wood Cleaner and the Defy Wood Brightener. What happens, and what should I do, if I overdo the coating with Defy Extreme and get a bit of a film? Leave as is if over applied as there is nothing you can do now to fix except strip it down and start over. If it is over applied, you may see so lighting of the stain after the first Winter. 2. Looks like there is still some residual stain on the deck? If so you will need to remove all. 4. Use the calculator to the right to find the sq footage and subtract the hot tub area. After I powered washed the 2 different decks the boards all have different color tones to them and fuzzies. After applying stain to small deck I have different tones of stain now. Is this me being a novice or the wood? I applied it with a hand brush 5 inch wide. Afraid to start the big main one now. Should I go to a solid stain instead so it will be even? Need help on what to do. Why do you only get 100-150 sq ft coverage per gallon. Other stains give 250-300 per gallon. Big difference when you have to cover alot. Have 700 sq ft to cover, its new pressure treated and aged never stained which means only 1 coat. Thats like 4-5 gallons more, looking at cost too. Was given sample at store and like the butternut alot. Other stains are actually very similar in coverage and none will get 300 Sq. feet per gallon. We are just more honest about it. For 700 Sq. feet and two coats, you will need about 7 gallons. read only need 1 coat for new wood never stained. should I apply 2 coats. thanks , like your butternut best of all stains sampled. How new? Typically just one coat for new wood and that means you would need 4-5 gallons. pressure treated pine was installed June 2016. Was told to let dry out and weather, nothing has been put on it. I powered washed it already , now waiting for rains to go away. This will be my first time doing something like this. Is it one or two coats and can you explain why. This is the product I decided to use. Put some on deck from samples given and this is the brown tone been looking for. Butternut stain. Since it is a year old you will need to do the 2 coats. The wood is very dried out this point and the first coat will soak into the wood deeply while the second coat evens out the appearance. This site has helped me out a lot. Thank you. I have a 25 year old house which is sided with horizontal cedar. I have power washed it to remove all of the mold, mildew and black tannin. It is now down to the natural color. I plan on using Defy Extreme Clear on the siding. Is that ok and should I put on 2 coats? Yes and yes. However, the tinted colors will last 3-4 times longer than the clear on horizontal wood. Thank you for the response however why would the tinted colors last longer than the clear since they are both DEFY Extreme? The color resins act as a UV absorber. Question on the stain pads. Which ones are the best? I also saw a that you could use a car was brush for applying? You can apply with a car wash brush. Make sure it is very soft bristles. As for the stain pad, Shurline or Padco brands. I am confused about how to apply one coat, and then apply another without ruining the first coat by stepping on it. Is it actually okay to walk on the first coat? How long do I have to wait between coats? 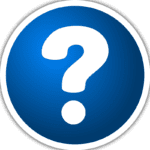 Answers to your question are in the article above. We are coming in to the season in which heavy overnight dew is occurring. Can I go ahead and stain? As long as the dew dries off before staining you can. I have a new deck completed the end of August made with Yellow Wood (PT) and Cedar skirting. First question: How long should I wait for the wood to season? Because of the oncoming lower temperatures (below 45) is it OK to wait until spring? The Yellow Wood folks say to just wait one month…what do you think? Second question: I am going to use Defy Extreme but read that Defy does better on cedar. Should I use both products or is it OK to just use Extreme on the whole deck? Use the Extreme for all wood and wait until Spring. Hi, reufbishing old cedar deck, had to replace all railings and posts, I used PT pine, clenaed and brightened cedar decking. I plan on staing the deck with Defy Extreme, and wiating until next year to do the railings, spindles. Will htere be a huge difference in color between cedar and pine? Not a huge difference but definitely a difference. No need to sand to a finer grit as that can create an issue with penetration. Best to wash down with water prior to applying the stain. Much better then blowing off the dust. Do you recommend also staining between boards and the bottom side? Best method (some are tight no gap, some have up to 1/4″ gap)? For bottom – do I need to use defy or can I save $ by using any good exterior paint simply to seal (won’t see it…4′ above ground below deck). This is new wood…I am using pressure treated pine, about 11 months old, already cleaned and used your brightener a couple weeks ago — works great btw). No need to to the bottom or sides. My deck is PT pine. I power washed it and then bleached it a month ago. It still looks clean and absorbent…not much rain here. Do I still need to use he cleaner and brightener? I would like to avoid these steps if possible because I’m old and it’s a hard job, but shoot straight with me. I plan to use the Defy extreme if the test samples I ordered look good. I also plan to do 2 coats . Thanks! If it prepped well then you can go ahead and stain. Indirect sun is best so it does not “flash” dry and dries evenly. Should be dry for 24-4hours before applying and should not rain for 12 hours after completing. 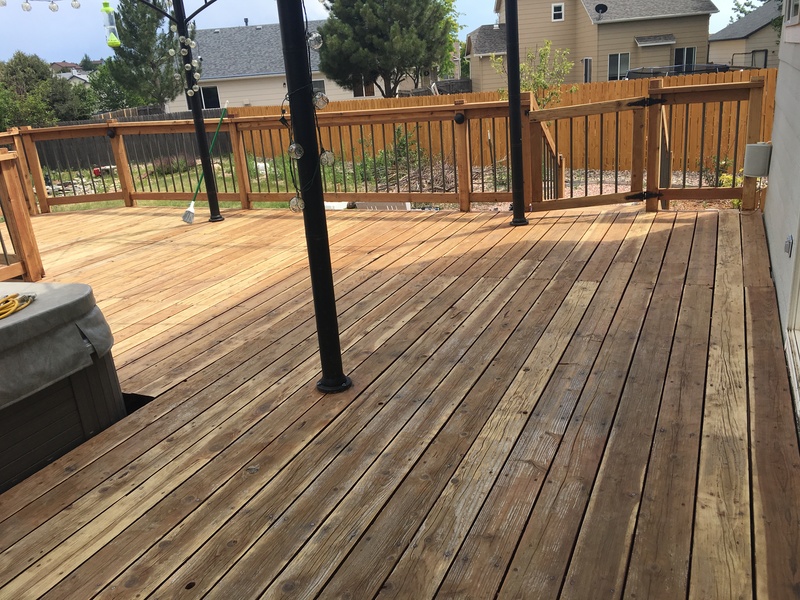 I purchased extreme and applied it on my clear cedar deck…is that okay? And, does the coverage listed on the container include the 2nd light coat? I have aprox 800 square feet – first time using this product after stripping old redwood deck. Have to order online so want to be as accurate as possible. Coverage is 150-200 sq. feet for one coat. For two coats it is 100 sq. feet. You will need about 8 gallons. What if I can’t finish my first coat of the whole deck in 60 minutes? 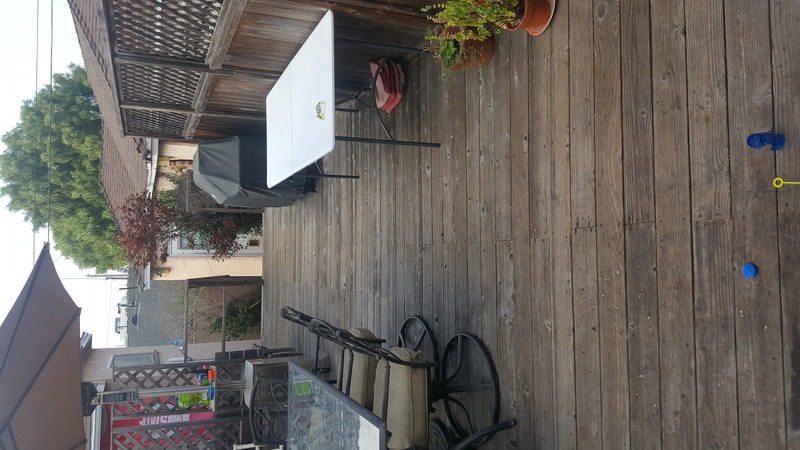 Can I do the deck in sections (stopping between boards, not on a board)? Best to do the entire floor and then go back and repeat. Hard to do in sections but is possible of you do not overlap into a middle of a board. can I apply a second coat after the first coat has dried? No you should not do this. A review I read indicated that Defy for Hardwood actually works/penetrates best on PTWood, but the Defy website lists Defy Extreme for PTW. Which is correct and what would be the difference? Defy Hardwood works best on Cedar and Exotic hardwoods. The extreme works best for pressure treated pine. thanks for your reply. It was very wet. So wet I could walk in it and not leave footprints. is back wiping simply wiping up excess stain? I fell on deck and made the stain distribute unevenly. Can I go back over it with a sock or rag and smooth it out. It was quite thick. Mike, back wiping is to make sure it is even and to remove excess stain. This needs to be done while the stain is wet and has not started to dry. I accidentally applied a third coat to one of my boards on my deck. What is the best way to re-do that board? Should I sand the stain off and start over? The rest of the deck looks great! Kelly, if it looks okay I would leave it alone. If not then sand it off. It’s supposed to rain tonight. 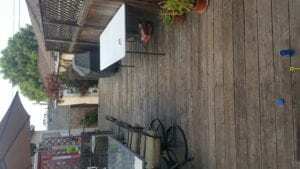 Can I start staining tomorrow if the deck is dry to the touch? How long to do I have to wait for the rain to dry? Carla, you should wait 24-48 hours after rain before applying. Yes you should still use a brightener. I’ve cleaned my 7 year red cedar deck with a mixture of water and oxiclean and dish soap. Ratio of 3 to1 to 0.2. Should I still use the brightener? You should be fine since you only used 40 grit and brightened after. I would assume the wood is pretty clean and absorbent. Horizontal surface will be ready for staining before verticals – more maintenance needed on rail system. If I have the right dry weather, better/OK to do the horizontal first vs waiting maybe a couple weeks? Did the Defy clean and brighten a few weeks ago, drum sanded today. Kurt, finish the rails than re clean all the wood before applying the stain all at the same time. To prep my weathered deck for Defy Extreme, I just drum sanded it. Look great, but tops of many galvinized nails no longer are galvinized. Can I apply stain as is and be protected from rust? If not, what it best way to spot treat these nails prior to staining? Kurt, there is no way to protect from rust now. It will happen no matter what and cannot be spot treated with anything. I am staining a new pressure treated pine dock (not deck) that is 13 months old. 1 or 2 coats on the decking? 1 or 2 coats on the vertical wood facing? Finally, does the Extreme clear color last as long as the Extreme natural pine color? Located in southeast Michigan. Thank you. Greg, the Defy Extrme in the Natural Pine will last 2-3 times longer then the clear. 2 light coats wet on wet.